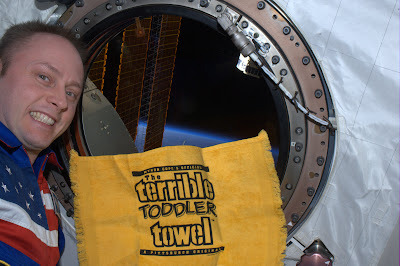 Another Terrible Towel in space at the International Space Station, from Kevin K.
There's a new Steelers song, filled with "guitars, pittsburgh accents, references to Jason Capizzi, and Myron Cope." --Sidenote from the last link: did anyone know Berger's dad was from Homestead? The Mitch Berger Burger sounds delicious, but the waitress can not serve it to anyone sitting farther than 25 yards away from the kitchen. Seattle Seahawk fans are the Ted Bucklands of the NFL (Scrubs reference). At first it seemed like sour grapes in the heat of the moment. Three years later, it's just kind of sad. You are out hunting and have no toilet paper. Your stomach rumbles as you search through your stuff. 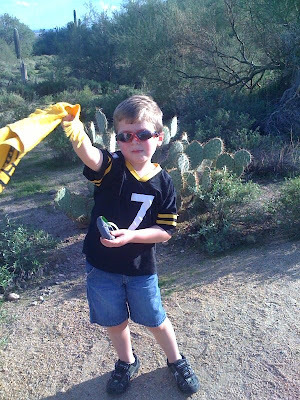 You find only an old terrible towel in your duffle bag. 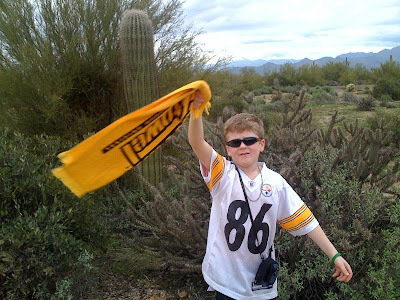 As a Steelers fan, what do you do? So the crotchedy old miser known as Smizik writes a long-winded, back-patting farewell article and now he's blogging. Something isn't adding up. Coincedence that this occurs moments after the ratings book comes out with MM on top? Why won't Smizik go away. Mondesi, you missed the most interesting part of the article. It was a Paterno drive-by piece about how Paterno is an idiot for not bending his academic rules for Fitzgerald. It also rips him by saying that Fitz wouldn't have seen the field his freshman year like he did at Pitt because Paterno doesn't play freshman. Just ask Derrick Williams, Deon Butler, and Jordan Norwoord. Anyway, the moral of this guy's story is that Walt Harris is a much smarter guy and better football coach than Paterno could ever hope to be. So jealous you all were blessed by his presence. Adam, you missed the part where no one cares what you think. Just like terrorists and cockroaches; you think you got rid of them,but they come right on back. I'm getting kinda sick with people trying to fake the Pittsburgh accent. Francis sounded like he was mixing his accents. Tools.